The 2018 Trashformer Team: Watch for them this summer in a community near you! Be on the look out for the 2018 Trashformer Team. 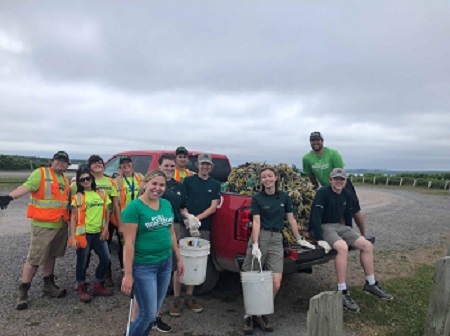 Monday to Friday this summer, Ben Gillis, Katy Barnes, Kirsten MacKeigan, Connor MacLeod and Brittany MacKenzie, (missing from photo) will be busy this summer, transforming our communities into litter-free areas. 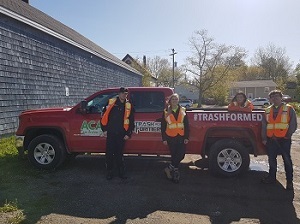 Watch for them in their Red Trashformer Truck this summer as the visit public areas across CBRM to clean up litter. Remember, all litter & debris have a disposal option and it’s NOT our community street and neighborhoods. Let’s help the Trashformer's by NOT LITTERING! Let’s Keep CBRM Litter Free. 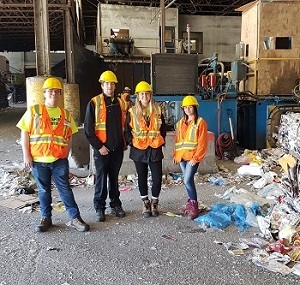 Trashformer's Ben Gillis, Connor Macleod, Katy Barnes and Kirsten MacKeigan touring Camdon Recycling Ltd. to learn more about recycling in CBRM. Disposing of your recyclables and paper products in blue bags is one way to reduce litter in CBRM. 1,638 garbage bags were filled with litter and debris and disposed of at the Waste Management Facility by the Trashformers during the 2018 program. The total weight of the contents contained in the 1,638 garbage bags they filled was 6,510 kg or 6.51tonnes.